Happy Valentines Day, everyone! I celebrated by buying myself some lovely chocolates, and enjoyed them very much! Ahhh, chocolate holiday! And on this delicious day, I'd like to give a shout out to my favorite game couples very quickly! First... Prince Vlad Tzepesci and Sorscha from Western Immoren (Warmachine by Privateer Press)! Man, I love these two. And with as many problems as this noble Prince and common soldier faced before, it all came crashing down when he accepted an engagement to the Empress of Khador, effectively ending any chance of ending up with his love interest. Add to that the fact that the Empress knows of his little heartthrob, and being a jealous woman, sent Sorscha off to the most dangerous theatre of war that Khador was in... officially because she's a great warcaster and they needed her help there (but we all know it's because she hope Sorscha will get herself killed!) Yikes! Devious! And the other couple we'll look at is my all time favorite... brought to us by the amazing Sandy Mitchell who writes for the Black Library (Games Workshop). Yes, it is Commissar Ciaphus Cain and Inquisiter Amberley Veil. These two embody the grim darkness that permeates the year 40,000. If not for the galactic war, they could finally be together... but if not for the wars, they would never have met. Oof... Due to their respective positions, these two cannot be together, though they are clearly made for each other. Though it's pretty clear that they discretely do manage to find some time alone, anything else is just not to be. Working Hard, or Hardly Working!!! Today, I bring to you one WIP, my second warcaster for the year, Sovereign Tristan Durant, and a set of models getting ready to go, the Witch Coven of Garlghast! I know what you're thinking... Commissar, isn't that a Cryxian model? Yup! I'm in the middle of a painting exchange with DTB. He's going to be taking care of the last two heavy jacks (after these two, I have all heavy jacks painted and ready to go for PoM!) and I'm going to paint up the Witch Coven and Pirate Queen Skarre! Base coat finished and all metalics washed! I love Tristan. Recently he took the spotlight as the main character in the new Skull Island Expedition book "Godless." His back story is right up my alley as one of the sane, good characters in the Protectorate. They are certainly few and far between... Tristan, Kreoss, Vilmon. Funnily enough, these are the models that I love to play with most! In fact, Tristan AND Vilmon have made it into my Faithful Masses list! Wow! One of the best parts of painting exchanging is getting to paint models that I normally wouldn't have a chance to work on. DTB is putting together a Cryx army so that we can have an army ready to go if we manage to snag a new player. So, I'm going to give these lovely ladies a go! The Fukuyama Gaming Club will be meeting on March 18, April 1, and May 20. And as I've mentioned before, some of our good friends from Iwakuni Air Base here in Japan went all the way over to Las Vegas to join the Las Vegas Open, and it sounds like they had a very good time. Maybe too good a time, as it turns out a certain award show was taking place just across the street! Oh well, at least fun was had, and everyone is safely back in Japan. 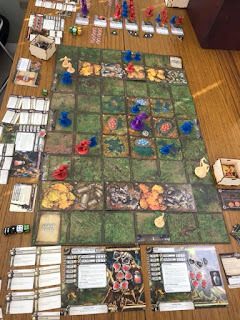 At our monthly meeting of the Fukuyama Gaming Club, we got in a few great Warmachine/ Hordes games, and also continued our trek through the Widower's Wood! Woo-hoo! We have officially entered the second half of the campaign, and we are going strong! 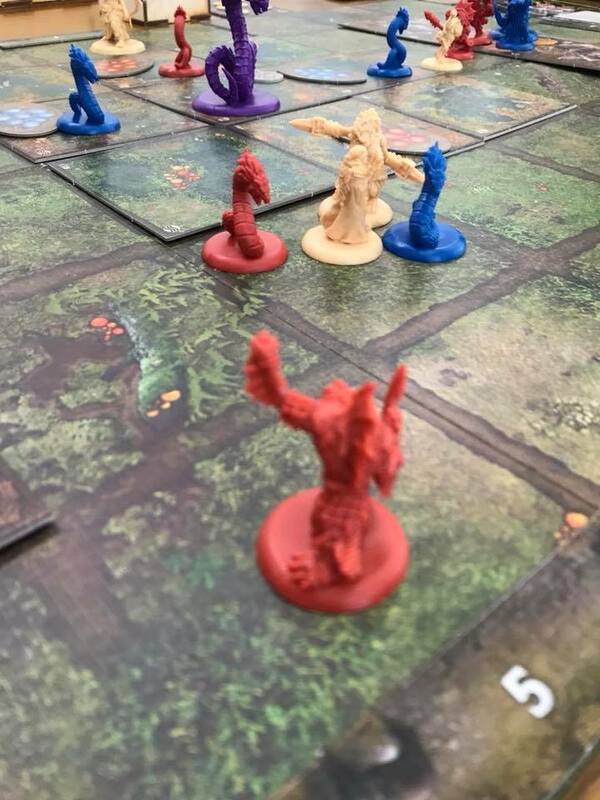 All of the characters have picked up some amazing abilities and items that are helping us get closer and closer to Rasheldonak, the insane Gatorman Witch Doctor who is trying to complete a devastating ritual to control the swamp. At the end of last chapter, our heroes had managed to capture several Gobbers that were running messages for the Gatormen, destroying Rasheldonak's ability to quickly coordinate his forces. Agata took over their interrogation, and found out that the Witch Doctor was going to try and capture a rare albino Tatzylwurm to use in his ritual. 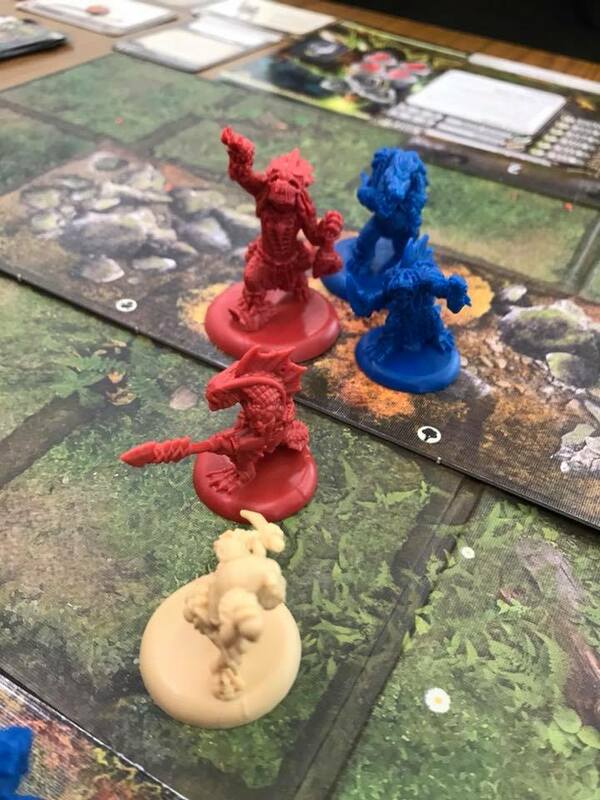 As our intrepid troop made its way to the Tatzylwurm's nest, they arrived just as one of Sheldon's Warlocks and his subservient Trogs were beginning the fight to contain the wurm. But even worse, the eggs in the nest are just beginning to hatch! We have to keep the big Tatzylwurm safe while taking down the Warlock. To accomplish this, I took over control of Agata, DTB continued to work with Olo and this time took over Skarg, and Vaskis fell to Leland! Okay... well, the Tatzelwurm is in the middle, along with four egg piles in the middle. At the beginning of each round, a Young Tatzelwurm will be spawned on each egg pile that matches the color priority for the round. Mommy Wurm will attack anything within 2 spaces of herself, focusing on those who are standing in the water. 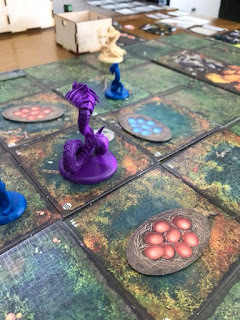 Looks like we have 10 rounds to keep the Tatzelwurm alive (luckily, we don't have to save the baby Tatzelwurms as they hatch). At the beginning of round 8, if the Tatzelwurm survives, the Warlock will spawn and we can bring the hurt! If we fail to save the wurm, the Warlock will spawn when the wurm goes down. We can do this! Our plan was to try and run interference on villains moving towards the nest, but letting Mommy Wurm take care of villains that get into the water. The heroes had to split into two groups again, so as usual we had a support character and a fighter per team. Olo and Agata went to the bottom of the board, and Vaskis and Skarg took the top corner. Again, we would be facing a Perilous Journey card. This time, the perils take the form of cane leeches, which will keep characters from being able to replenish their feat cards...So, off we go! Olo is off in search of Side Quests! Round one, and the first event card of the game is PERILOUS JOURNEY!!! Yikes! And the cane leeches marker gets placed on the space with Mommy Wurm! I guess that's okay, it's not going to bother her any, and hopefully we won't be close enough for it to trouble us. Olo started things off by starting to make his way over to the Side Quest card near him. We're still trying to find the second in the chain quest that we started, so hopefully, we'll make it this time! Right away the Bokor on the board moved into the water to challenge Mommy Wurm, but we're not worried, Mommy will take care of him! On her activation, she took a snap at him... BUT SHE MISSED!!! Uh-oh, well... our plan has already crumbled, and Mommy Wurm might be in trouble. Olo kept running for his Side Quest, but during his Villain Action card, the Bokor was activated an dealt one damage to Mommy Wurm. Skarg stepped forward to help her out by killing TWO Gatormen with his amazing bow work, and Agata took out the Bokor. 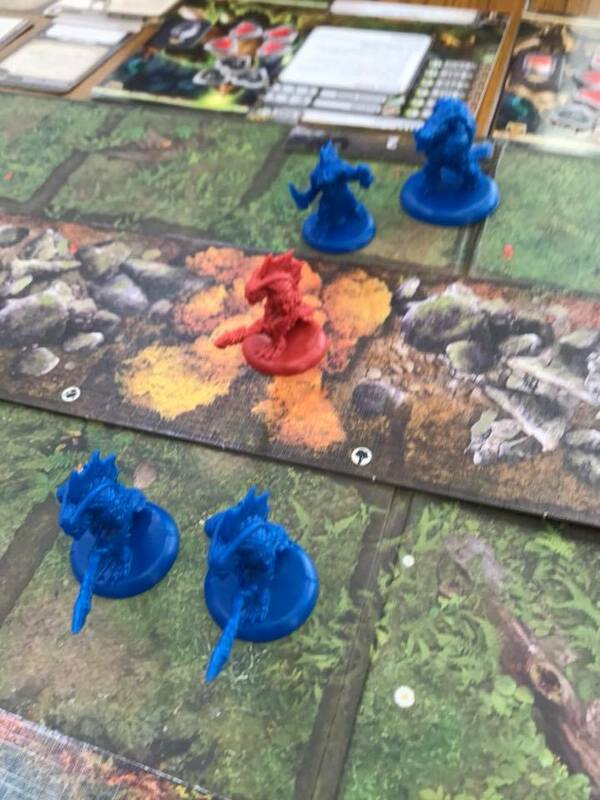 Sadly, her villain action also activated some Trogs near Mommy, and she took 2 more damage! Aaaahhhhhh!!! Ugh, Mommy takes some damage! Olo made it! A Phylactery of Venom is now ours! Too bad that we didn't get the second card in the chain, but the Phylactery is a great card that lets you go through your feat card deck and pick one once per chapter. On the down side, he's now being chased by SO MANY VILLAINS!! Good luck, Olo! At least he's pretty slippery and has some traps to throw down. Vaskis missed a second chain lightening attack in a row, and on his villain action Mommy Wurn took ANOTHER damage! We're on the third round, and she's taken almost half of her damage! 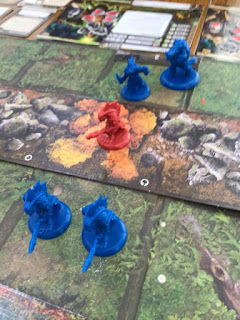 It's not looking good... Skarg helped out even more by killing another 2 Gatormen! Woot! And Mommy finally found a Trog and chomped him into chum! 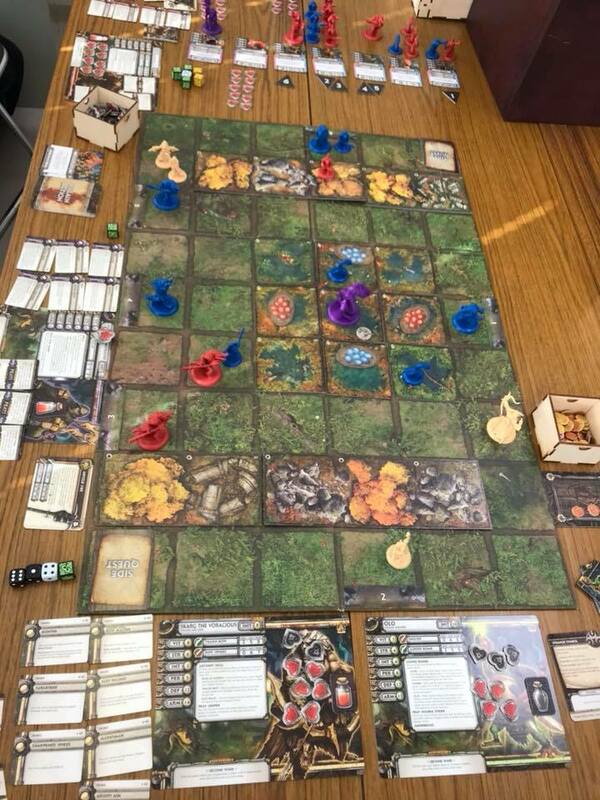 Vaskis, high on his attack on the Bokor, took a shot to try and clear out some of the mess around the nest... and on his attack and multiple re-rolls, rolled NOTHING BUT 1'S! Argh! 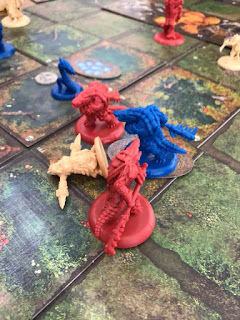 Dice... such a fickle mistress... Agata took aim at a Baby Tatzelwurm with both of her katara, and ALSO missed both attacks! Ugh! However, she was able to use her Feat "Staredown" to keep Mommy Wurm from charging. Hahahahahaha! Agata is so unbelievably terrifying, she can keep a full grown Tatzelwurm in check by giving it a death glare! Hahaha! Event card... Patrol! Oh Noes! 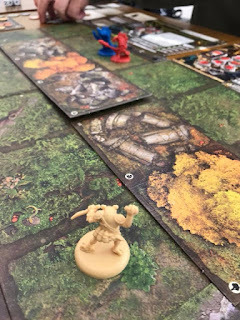 The Mist Speaker, Bokor and a Gatorman move up, ready to smash into Mommy Wurm. Olo managed to use his feat "Hoof It" so that he could glue the space that the villains kept spawning in, since the mass of baddies was getting totally out of control. Skarg and Agata kept trying to clear out the nest area... and Round 8 begins! Some glue for you, and some glue for you! Round 8!!! Ominious Silence reigns as the Finale begins! 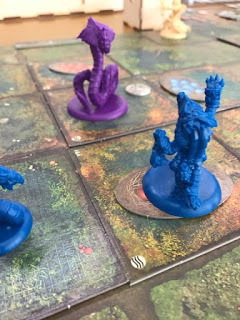 The Warlock and two more baddies appeared near the Wurm!!! NOOOOOOooooooo! Olo managed to flame bomb the Mist Speaker! Yeah! That's a good one to get rid of! But... the Warlock blasts Mommy Wurm for double damage, and she took another damage from a charging Gatorman... and went down. Okay. So, mission one fail. Luckily, we can still pull a win if we take out the Warlock. Time to go CRAZY!!! I think it's time for our closer, the redoubtable Agata, to do her thing! But before she could go, Vaskis made the chain lightning finally work out on some Gatormen. Then, on his villain activation, THREE GATORMEN CHARGED AGATA!!! And down she goes. Incapacitated! Oh noes! Agata has finished every chapter for us so far, and now she's out! Luckily Vaskis is close by, and has a restorative potion, so hopefully, she can still get back on her feet. She did manage to drag herself by the hooves towards the Blackclad. But he is in trouble too, because on Agata's villain action card he takes the SAME THREE GATOR CHARGES!!! Luckily Vaskis is crazy sly, and took NO damage! Go Vaskis! We have a piggy down! Piggy is down! 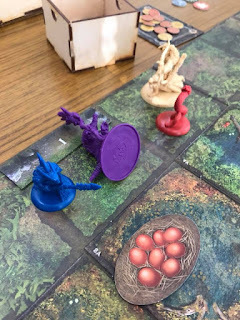 Top of Round 9, the Warlock knocked down Skarg (and also killed one of his own Gators)! Luckily, he's not out, just down. Olo threw a flaming Vitrolic gourd at the Warlock and HIT!!! Yeah! Hit with double damage! Vaskis moved up and revived Agata, who stood up with full health, ready to smoke some gator meat when her turn ran around. Skarg stood up, took aim, and shot twice straight into the Warlock's FACE!!! Boom! Dead Warlock!!! And Skarg ripped out his heart and ate it as an offering to the Devourer Wurm! Wow! MVP to Skarg today, for sure! His tag team with Olo was amazing to win the game! This game was loooooooooong, certainly the longest we've had so far. It took about 3 hours to play, almost 1 hour longer than our usual game. But so much fun! I have never seen such bad luck for us with Villain actions! It seemed almost every time the worst possible villain possible was activated. The good news was we killed so many Gators, we wracked up a huge 14 XP per player, and Agata got passed the Phylactery of Venom (it's pretty in character for the Slaughterhauser to have such a thing, anyway!) Then, something exciting happened... a dice was rolled to see if we were going to play the floating Kickstarter Exclusive mission next meeting... AND WE ARE!!! Yeah! Next up, Ghost Trap! See you then! That game looks like it was so much fun! I can practically hear the excitement in your voice as I was reading. Looking forward to seeing what you do with those witches.